I have got a 2.67 GHz Celeron processor, and 1.21 GB of RAM on a x86 Windows XP Professional machine. My understanding is that the Android Emulator should start fairly quickly on such a machine, but for me, it does not. I have followed all the instructions in setting up the IDE, SDKs, JDKs and such and have had some success in starting the emulator quickly, but that is very rare. How can I, if possible, fix this problem? Even if it starts and loads the home screen, it is very sluggish. I have tried the Eclipse IDE in version 3.5 (Galileo) and 3.4 (Ganymede). 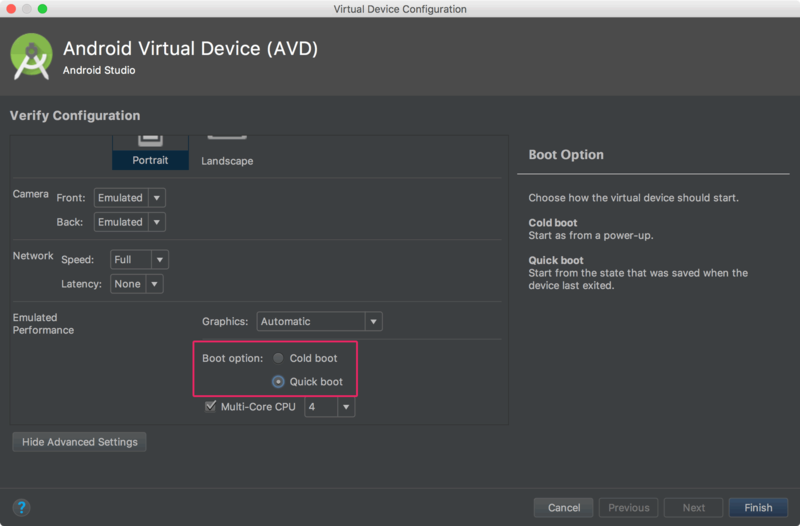 You can now enable the Quick Boot option for Android Emulator. That will save emulator state, and it will start the emulator quickly on the next boot. Click on Emulator edit button, then click Show Advanced Setting. Then enable Quick Boot like below screenshot. Android Development Tools (ADT) 9.0.0 (or later) has a feature that allows you to save state of the AVD (emulator), and you can start your emulator instantly. You have to enable this feature while creating a new AVD or you can just create it later by editing the AVD. Also I have increased the Device RAM Size to 1024 which results in a very fast emulator. Refer to the given below screenshots for more information. 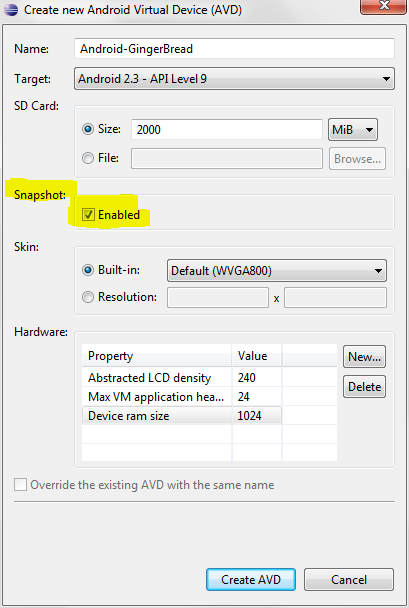 Creating a new AVD with the save snapshot feature. Launching the emulator from the snapshot. IMPORTANT NOTE: Please first refer to the Intel list about VT to make sure your CPU supports Intel VT.
HAXM stands for - "Intel Hardware Accelerated Execution Manager"
Currently, it supports only Intel® VT (Intel Virtualization Technology). The Android emulator is based on QEMU. 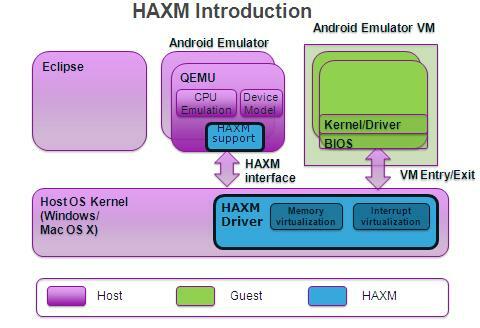 The interface between QEMU and the HAXM driver on the host system is designed to be vendor-agnostic. Update Eclipse: Make sure your Eclipse installation and the ADT plug-in are fully up-to-date. 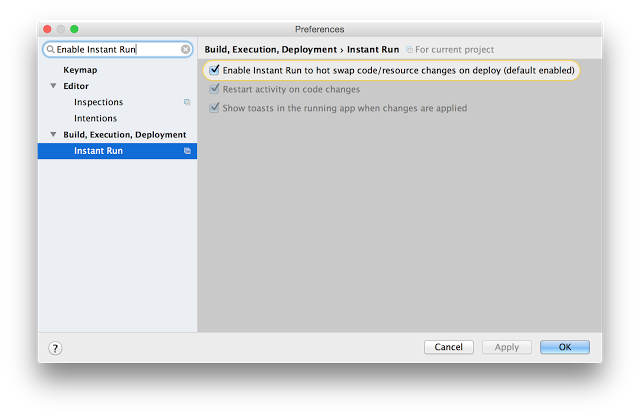 Update your Android Tools: After each Eclipse plug-in update, it is important to update your Android SDK Tools. 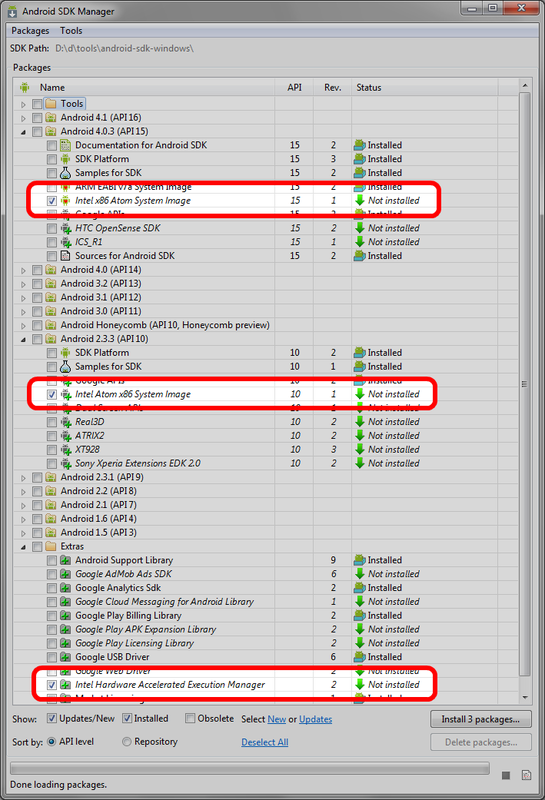 To do this, launch the Android SDK Manager and update all the Android SDK components. To take advantage of HAXM, you must be on at least release version 17. If the installer fails with the message that Intel VT must be turned on, you need to enable this in the BIOS. See the description for how to do this in Enabling Intel VT (Virtualization Technology) . Download the ISO file that you need. Create a virtual machine as Linux 2.6/Other Linux, 512 MB RAM, HD 2 GB. Network: PCnet-Fast III, attached to NAT. You can also use a bridged adapter, but you need a DHCP server in your environment. Install Android x86 on the emulator, run it. Press Alt+F1, type netcfg, remember the IP address, press Alt+F7. Run cmd on your Windows XP system, change the directory to your Android tools directory, type adb connect <virtual_machine_IP>. Start Eclipse, open the ADT plugin, find the device, and enjoy! UPDATE: The latest version of Android studio (2.x) made major improvements to the bundled emulator. It's responsive and has a whole bunch of features. The installation of the plugin can be done by launching Eclipse and going to "Help / Install New Software" menu, then just add a new Update Site with the following URL: http://plugins.genymotion.com/eclipse. Follow the steps indicated by Eclipse. This emulator is fast and responsive. GenyMotion allows you to control various sensors of your device including the battery level, signal strength, and GPS. The latest version now also contains camera tools. The emulator included in your (old) version of Eclipse is very slow. Recent emulators are faster than they use to be in 2010. Update your SDK/IDE. Personally, I use a real phone to do my tests. It is faster and tests are more realistic. But if you want to test your application on a lot of different Android versions and don't want to buy several phones, you will have to use the emulator from time to time. The startup of the emulator is very slow. The good thing is that you only need to start the emulator once. If the emulator is already running and you run your app again, the emulator reinstalls the app relatively quickly. Of course, if you want to know how fast it will run on a phone, it is best to test it on a real phone. 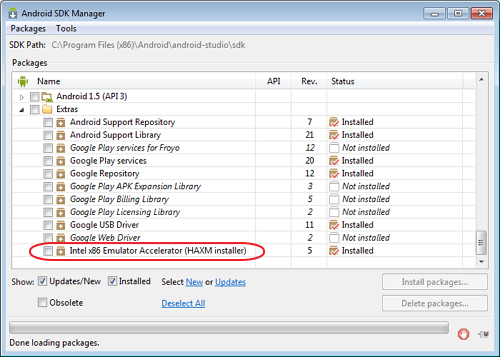 Intel released recommended installation instructions for the ICS emulator on May 15, 2012. This worked for me. The emulator is now fast and the UI is smooth. The first half of the instructions are detailed enough, so I will assume you were able to install the Intel x86 Atom System Image(s) using the Android SDK manager, as well as Intel HAXM. Use GPU emulation. You cannot use the Snapshot option when using GPU emulation as of this writing. Ensure that GPU emulation is set to "yes". Set the device memory to 1024 MB or more, but not more than the Intel HAXM setting. I use 1024 MB per device and 2048 for HAXM. Always double-check the settings after saving! The emulator is very picky about what it allows you to set, and it will revert configurations without telling you. With these settings the software keyboard no longer appears, nor do the on-screen back, menu, and recent keys. This appears to be a limitation of the current ICS Intel x86 system image. You will need to use the keyboard shortcuts. On Mac OS you will need to hold fn + control for the F1 - F12 keys to work. Page up/down/left/right can be performed using control + arrow keys. You can create emulator.bat with following command to start the emulator. It will start faster. I've noticed that the emulator starts much faster if there's no Dalvik Debug Monitor Server (DDMS) connected. So if you start the emulator from Virtual Device Manager "SDK Setup.exe" and Eclipse is not started, the emulator works faster. If you start the emulator from Eclipse: DDMS is there, so sometimes the emulator is extremely slow, but sometimes it's faster. Emulators are slow. There's really nothing you can do about it, but there are alternatives to the emulator. To make your emulator faster, you can host a GPU and use a lighter Android version (Android 2.3 (Gingerbread)). Developing on a Mac would be better. Why use an emulator, BTW? Using a real phone makes more sense. 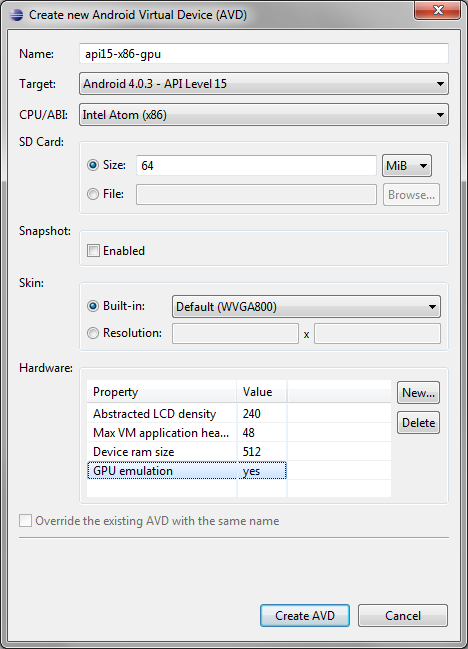 For enabling GPU aceleration, run the emulator from the command line or add "-gpu on" to the additional emulator command line options in the AVD configuration. For using the CPU machine extensions, you have to install the driver (caution because it can conflict with existing VirtualBox or VMware drivers). Once it's installed it will be used automatically whenever you use an x86-based AVD. Try to disable your antivirus. Maybe it will make emulator a little bit faster. Android SDK rev. 17 supports Virtual Machine Acceleration using AMD and Intel virtualization technologies. This feature can improve the emulator performance a lot! The option -cpu-delay <delay> described in Emulator Startup Options can help. This made animations buttery smooth and sped up adb install tenfold. 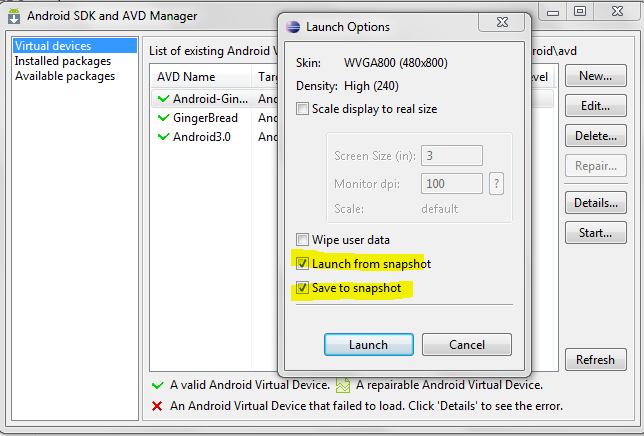 Android emulator release 9 has a new "snapshot" feature. You can save the state of the emulator (make an image of the emulator) and avoid booting when you start the emulator. You can review the emulator issues on the Google I/O 2011: Android Development Tools talk, starting a 0:40:20. The emulator runs slowly because the complete Android environment is running on emulated hardware and the instructions are executed on an emulated ARM processor as well. The main choking point is rendering since it's not running on any dedicated hardware but it's actually being performed through software rendering. Lowering the screen size will drastically improve emulator performance. Getting more/faster memory isn't going to help. They've mentioned, at the time, that they're developing an interface that would allow the emulator to pipe certain instructions through the host hardware, so eventually, you'll be able to leverage emulator performances with the raw power of desktop hardware. The current (May 2011) version of the emulator is slow particularly with Android 3.0 (Honeycomb) primarily because the emulator does not support hardware GL -- this means that the GL code gets translated into software (ARM software, in fact) which then gets emulated in software in QEMU. This is crazy-slow. They're working on this problem and have it partially solved, but not with any sort of release quality. Check out the video Google I/O 2011: Android Development Tools to see it in action -- jump to about 44 minutes. A new option is the Visual Studio Emulator for Android--it's fast, Hyper-V, x86, and free to download even without VS. Try Genymotion for Android Studio. Blazing fast! Just needs one time installation. No more AVD pain. 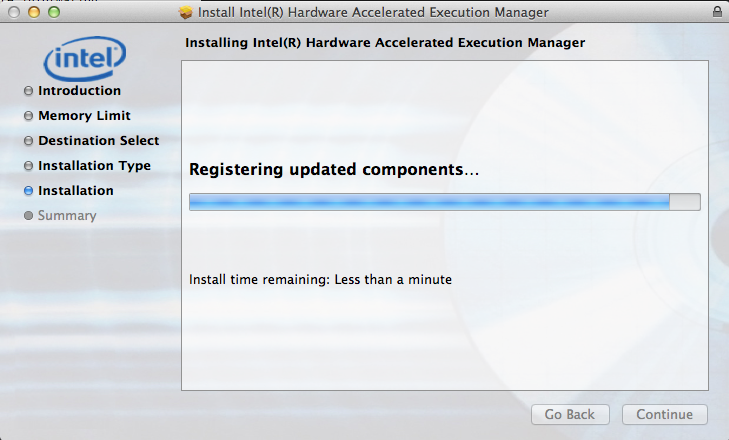 First, install the Intel x86 Emulator Accelerator (HAXM). This can be downloaded directly from Intel or using Android SDK Manager. In the SDK Manager, it's located under Extras. In the version of Android Studio I used (0.8.9), Android SDK Manager downloads HAXM but doesn't actually run the installer (I assume this will be fixed in later releases). To run the installer I had to go to C:\Program Files (x86)\Android\android-studio\sdk\extras\intel\Hardware_Accelerated_Execution_Manager and manually launch intelhaxm.exe. HAXM works with Intel devices, so created a new Emulator with Intel CPU. This improved things considerably, but the emulator was still feeling a bit sluggish. 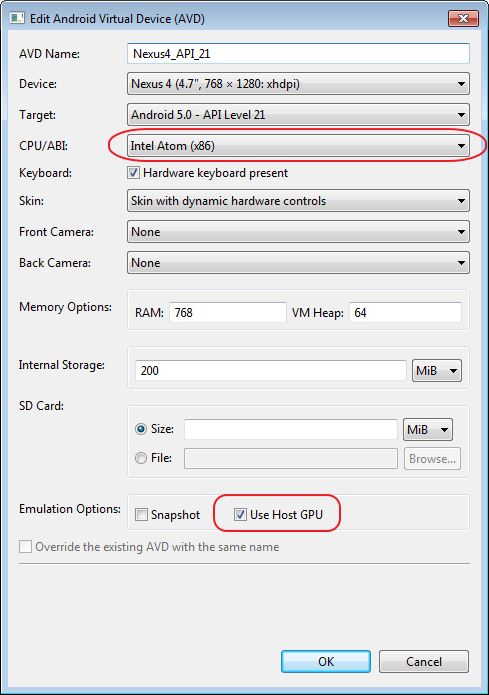 The final step was selecting Use Host GPU in Android Virtual Device Manager (AVD). After these changes, Android Emulator was launching in 5-10 seconds and running without any noticeable lag. Be aware that these features are hardware dependent (CPU/GPU) and may not work on some systems. To add further information to this. And now the emulator (although takes a while to start) seems to be running faster than previously. It might be worth people upgrading their JVM. Here's what I noticed nobody mentioned it at all. Here's what you can try. It does speed up the emulator for me, especially during loading time. I noticed the emulator is only using a single core of the available CPU. I set it to use all available processors. When the Android emulator is starting, open up the Task Manager, look under the Process tab, look for "emulator-arm.exe" or "emulator-arm.exe *32"... Right click on it, select Processor Affinity and assign as much processor as you like to the emulator. Android emulator is dead slow. It takes 800MB memory while running. If you are on Windows, You can use Microsoft Android Emulator. It is superb, provides you functionalities more than Android Studio Emulator. And most important it is fast ( consumes 13MB only). It comes with Visual Studio 2015 Technical Preview. I am using it and happy with it. I downloaded and installed entire VS pack, I need to look how we can install VS Emulator only. After developing for a while, my emulator became brutally slow. I chose wipe user data, and it was much much better. I am guessing that it takes time to load up each APK file you've deployed. Well, since somebody suggested Android x86 as an alternative testing emulator, I'll also present my favorite. This might not be an alternative for everyone, but for me it's perfect! After compiling, it installs instantly. It is very impressive, considering I have rather an average computer hardware (dual core with 4 GB of RAM). I had intermittent slow emulator (SDK v8.0) load times, up to three minutes on Intel Core i7 920 2.67 GHz CPU running on Xubuntu 10.04 VirtualBox 3.2.12 guest with Eclipse (3.6.1) loaded. I changed the VirtualBox guest memory from 1024 MB to 2048 MB and from that point on, I never experienced the slowness again (load times consistent at 33 seconds, CPU load consistent at 20%). Both Eclipse and the emulator are memory hogs. To reduce your emulator start-up time you need to check the "Disable Boot Animation" before starting the emulator. Refer to the Android documentation. If in case you don't know, you do not need to close the emulator every-time you run/debug your app. If you click run/debug when it's already open, your APK file will get uploaded to the emulator and start pretty much immediately. Emulator takes annoyingly long time only when it started the first time. Here are some tips to speed up the Android emulator: How to speed up the Android Emulator by up to 400%. I noticed that the my emulator (Eclipse plugin) was significantly slowed by my Nvidia graphics card anti-aliasing settings. Removing 2x anti aliasing from the graphics menu and changing it to application controlled made it more responsive. It is still slow, but better than it used to be. Good way to speed up Android Emulator and app testing is Install or Upgrade your Android Studio to Android Studio 2.0 version and then go to app open Settings/Preferences, the go to Build, Execution, Deployment → Instant Run. Click on Enable Instant Run. And After That This will ensure you have the correct gradle plugin for your project to work with Instant Run. However Android Studio is right now in Preview you can try it now. Not the answer you're looking for? Browse other questions tagged android performance android-emulator genymotion qemu or ask your own question. Why is the Android emulator slow? Why is the Android tablet emulator so slow? Is there way to speed it up? How to increase speed of emulator? Is there a better (i.e. faster) Android emulator for debugging?